Coffee added to your bag! More info: see Help - where do I start? We are a growing company of coffee enthusiasts, roasting espresso blends and a range of single origin beans. We supply our flagship café on Hackney’s Broadway Market, our own stall on market day, as well as a growing list of establishments who have chosen to work with us. 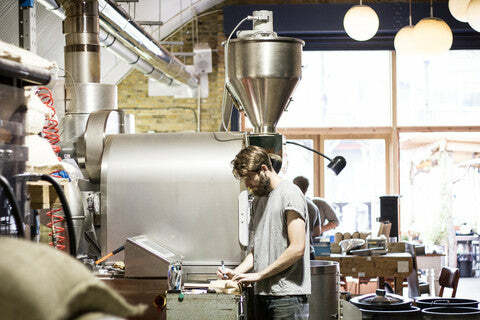 Established in 2005, our cafe is considered one of the pioneering venues for London’s now-famous coffee revolution. It can be dirty work at the coalface of the roaster, but thanks to almost a decade of experience, genuine love for our industry and dedication to our craft, we can manage as many natural variables as possible to provide our customers with high quality coffee. This same dedication is applied to our “cupping” process, with our team tasting our coffee as often as possible. It keeps our palates developing and our people inspired. With an ever-expanding range of brew-methods out there, we maintain a constant exploration of flavour and extraction technique to understand how our roasts react in coffee-making equipment. We create a constant feedback loop between wholesale customers, our own baristas and a growing market of home-coffee enthusiasts to ensure we are able to satisfy the increasingly-educated palates of coffee-drinkers. Whether you’re a small office or a high volume café, we are able to provide speciality coffee for your needs, roasted perfectly and how when you need it. We have a detailed understanding of cafes, restaurants and bars, and love to work with people that share our fundamental goal of serving great coffee. Climpson & Sons Coffee Roasters was born out of Burgil Coffee, a market stall established in the early noughties by an inspired Englishman, Ian Burgess, who returned from 5 years of drinking amazing coffee in Australia determined to offer the same quality coffee in London. After a few years on the market circuit, he set up shop in East London’s Broadway Market, recognizing the potential of the location and taking on the name of the old butchers’ shop for the business: Climpson & Sons. In 2005 he purchased his first coffee roaster (a 3kg Whitmee) and created a new business supplying the busy café with freshly roasted beans. As London’s appreciation of a decently made coffee blossomed, café owners both established and new sought a better flavour from their espresso shots, pushing the limits of coffee making skills to new levels and the standard of espresso service with it. Climpson & Sons became known as one of the pioneers of this new “third wave” of coffee style, exploring new coffee origins and presenting consistent and intelligently crafted coffee for the retail and wholesale market. In 2008 he upgraded to a 15kg Toper coffee roaster, and in 2011 added a 25kg Probat to help keep up with demand. By mid-2011, Climpson & Sons had added the words “Coffee Roasters” to their moniker, signifying their intent to focus on sourcing and roasting quality green beans. The arrival of Danny Davies in 2010 brought many years of roasting and coffee business experience to the equation. Danny supplied Ian beans early on in the Burgil Coffee days and they maintained their friendship whilst Danny set-up shop in the vibrant Melbourne coffee scene. When Danny returned to London, it was a natural fit. The café continues to supply amazing coffee to an ever-growing base of regulars, and the retail coffee bean business both in-store and online has soared to new heights. The result of thousands of hours roasting and tasting new coffees is the current established range of blends and single estate coffees Climpson & Sons Coffee Roasters offers. The latest development at the end of 2013, was the purchase of a Loring SmartRoaster. This roaster reduces greenhouse gas emissions and energy consumption by up to 80%. The Loring recycles air inside the roaster, creating consistency year around and all leading to a cleaner cup offering. When do we roast and post your coffee? All our coffee is roasted to order and dispatched by courier.